Our team continuously tracks news about media streaming, online video and audio from around the globe. This helps us understanding where the industry goes and what can we follow it. So we decided to make a small digest of what we thought might be interesting for our customers and followers. A few words on finances. Twitter acquires Periscope, the Meerkat-style live streaming app. Congrats to both teams! Interesting news from music industry: US streaming revenues overtake CD sales. Spotify, Rhapsody and other audio services work hard on that. A long-time case between Wowza and Adobe about RTMP is now closed. Wowza Media Systems and Adobe Systems Settle Patent Cases. Which seems to be the right thing, especially now when RTMP share is continuously going down. A new patents pool has been started for HEVC/H.265. The HEVCAdvance company will be now responsible for it with more new to appear in Q3 2015. Nicolas Weil from Akamai has released a great article on The State of MPEG-DASH 2015 which gives ideas on where DASH is now and where it's moving towards. More news on DASH: bitmovin has released MPEG-DASH Device Compatibility digest to give visual overview of what's up with DASH from devices' and browsers perspective. WMSPanel is an associate member of DASH Industry Forum and we keep watching after this technology very closely. StreamingMedia.com gave a great article on How to Shoot Aerial Video Using Drones and Quadcopters. We look forward to seeing more on aerial video at NAB Show 2015 soon. YouTube sheds some light on its 360-degree video: A new way to see and share your world with 360-degree video. Same news from Facebook: they will support spherical video In news feed and Oculus as was announced on F8 conference. Speaking of F8: Facebook Will Now Let You Embed Facebook Videos On Other Sites which reminds of YouTube embedding techniques. We'll definitely see something new in embedded videos soon. April will be full of news from NABShow. Our team representative will be there to bring something interesting, so follow us to get news and updates, and let us know if you'd like to meet there. Good news for MacOS users. Our team has completed porting Nimble Streamer to MacOS, so now all the streaming features previously available for Linux and Windows are now working on MacOS. It's the same excellent Nimble software which is already used for Linux and Windows servers worldwide, and now you may also try it on your Mac. Basic steps include WMSPanel registration (if you haven't done it yet), installation via setup wizard and server registration. Having Nimble Streamer installed you may setup all the streaming scenarios which we have a lot in our features package. Feel free to share your MacOS usage experience of Nimble, we're opened for any feedback. Install Nimble Streamer for Mac now. WMSPanel and Nimble Streamer February news are online. In-depth statistics were updated with grouping and comparison. WMSAuth paywall articles have a couple of useful updates. A new load balancing article is available. Nimble Streamer now has Windows support. Nimble AES-128 encryption support for HLS is ready. MP4 tracks selection support for VOD HLS has been released in Nimble. Icecast metadata support was added in Nimble. Read this news digest to get more details. Last month we've added Icecast audio and MPEG-TS among other protocols. Nimble Streamer customers use them more and more extensively, especially with the latest Icecast meta tags support, so we'd like to start tracking their dynamics as well. We still see huge HLS share (about 69%). 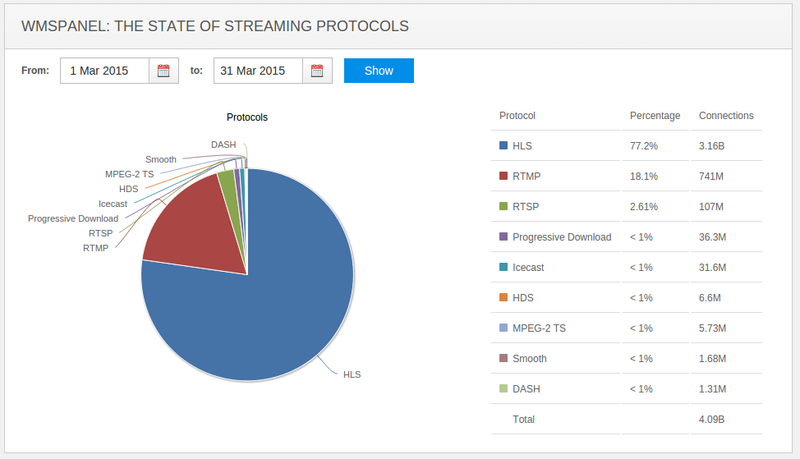 The RTMP share (19%) decreased while progressive download (6%) went up. We'd like to emphasize the significant rise of MPEG-DASH to 780K views. This is the result of latest MPEG-DASH feature set available in Nimble Streamer. All these metrics calculations are based on 2.8 billion views. Check them below. You can compare that with January stats below.